Help prevent the return of a malevolent minor Daedra. 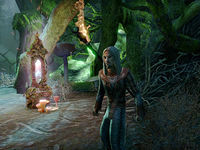 Finvir, a Wood Elf down in the Bad Man's tunnels, claims he is one of the mages that originally summoned the Dremora Lord now posing as the Bad Man. Speak to Finvir and he says he was part of circle of mages that summoned the Bad Man. He tells you to bring him some gems from the bones of his fellow mages. When you have three ceremonial gems return to Finvir and get your reward. This page was last modified on 22 June 2018, at 04:37.